Performing an ERMI is a way to determine whether the presence of water damage in a building (WDB), has caused mould amplification, which can very likely cause negative health consequences to the occupants. Samples for ERMI are analysed using Mould Specific Quantitative Polymerase Chain Reaction (MSqPCR). Data obtained from this is assessed and interpreted by reference to a database of similar ERMI data acquired from normal homes. The test is an objective, sensitive and standardised method that can identify and quantify selected mould species. The usual sample is settled dust collected in homes and buildings to determine the concentrations of the DNA of the different species of mould. While there is a wide spectrum of moulds that can be analysed in this way, 36 species of mould are detected. The research on which the procedure is based selected 26 of those moulds as being associated with WDB (the Group 1 moulds) and 10 common species (Group 2) that were not found to be associated with WDB. The first step to calculate the ERMI is to total the individual log10 of the Group 1 moulds and then total the individual log10 of the Group 2 moulds. The ERMI is then the difference between these two totals. Simply put, a home or building with a high ERMI value has a greater chance of causing a mould problem for its occupants than those with lower ERMI. The US Environmental Protection Authority (USEPA) developed ERMI to provide a straightforward, objective, sensitive and standardised way to assess mould using a ranking system based on dust samples collected from homes. The ERMI will help predict the mouldiness of homes. Based on widely published data from EPA researchers and the 2006 HUD American Healthy Home Survey, the test has been developed as a tool to evaluate the potential risk of indoor mould growth and associated health effects to occupants. In order to most effectively use this tool, the ERMI obtained needs to be compared to a national database. Indices were determined using this method for 1,096 homes across the U.S. as part of the 2006 HUD American Healthy Home Survey. 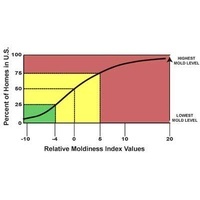 Individual indices, ranked from lowest to highest were used to create a national Relative Mouldiness Index (RMI) Scale. In initial studies by the USEPA, the concentrations of different mould species in "mouldy homes" (homes with visible mould growth or a history of water damage) and "reference homes" (homes with no visible mould) were compared. Based on those results, mould species were selected and grouped into those with higher concentrations in mouldy homes (group 1) and those with lower concentrations (group 2). To calculate the ERMI the individual concentrations of the mould species detected are log-transformed and the sum of group 2 logs is subtracted from the sum of group 1 logs. The ERMI process involves the analysis of a sample of dust from a home or other building. Dust is first extracted from the sample providied, then fungal DNA is extracted and purified from the dust. This fungal DNA is then analysed using MSqPCR. This is a highly specific DNA-based method for quantifying mould species. The ERMI graph makes it possible to compare one house's "mouldiness" with another without being a statistician. One of the reasons why the ERMI has become such a powerful test for mould is that it also provides detailed information relating to the identification of species of mould present. Traditional methods of mould sampling, such as air sampling and microscopic identification, fail to identify moulds to species because some species of mould have virtually identical spore structures often making it impossible to distinguish between them. Determining the species of mould can be helpful for a number of reasons. One of which being that certain moulds are associated with certain substrates. For example, Stachybotrys grows well on wet cellulasic material, so if it is present an assessor will look in the walls as Gyprock/drywall could be that source. Other species of mould are associated with flooring and carpeting so if certain types of mould are present they might indicate a problem behind carpet or other flooring. 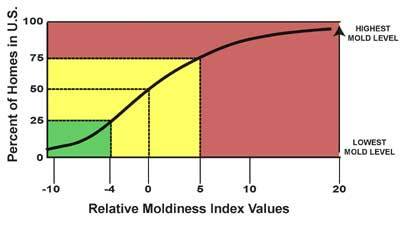 From the perspective of the health of occupants, there are published relationships between certain mould species and deleterious health consequences. MouldLab offer two methods for collecting dust samples. The original ERMI process used vacuum dust sampling where a special nozzle is fitted to a vacuum cleaner and a sample of dust is taken by masking off a 900 x 1800mm rectangle in the occupants living room and a similar area in the master bedroom. They are each vacuumed for 5 minutes to obtain a composite sample. One clear advantage of this test is that the carpet acts as a repository for the mould spores to collect over time. An issue that also occurs is that when a home has been water damaged the carpet may have been removed. We have included a video on the product page that outlines the steps for vacuum sampling. One clear limitation of ERMI vacuum sampling is that many homes do not have carpet, and many people who are susceptible to mould related illness have chosen to have wooden or tiled floors. As a result, the "Swiffer Cloth Method" was developed. It is important when sampling to collect enough dust for analysis, at least 5mg.